Contact us for careful and humane honey bee removal and relocation! There is a new trendy hobby that many people, even in urban areas, are starting to cultivate. What is it? Beekeeping! While keeping honeybees is a skill that many people can gain knowledge of and appreciate, having a large hive of honeybees isn’t something that everyone appreciates on their property! Here at Florida Bee Removal, we recognize that honey bee removal is something that many of our customers are looking for. If you are one of them, we would love for you to call us to help you with your Lakeland, Florida property. Here in Florida, we have great weather for bees. It’s often warm, moist, and attracts a lot of flowering growth, all of which make for a great honeybee environment. Honeybees tend to build their hives just about anywhere, which can make them problematic for home or business owners! They might choose to build a hive inside a hollowed-out tree, the crevice of a large rock, or in the eaves of your roofline. 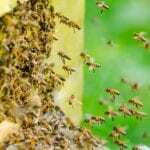 Honey bee removal needs to be done carefully and by professionals to ensure that, once gone, the honeybee scouts are not able to find their old stomping grounds on your property and build the hive up again! Even if you enjoy beekeeping, you might find yourself in need of honey bee removal. When a honeybee decides to build a hive, it might do so in the areas that you have set up for it, or it might decide that a hole in your stucco is much more attractive for hive-building! No matter your need for honey bee removal, we want to help you. Contact us here at Florida Bee Removal today for more information about honey bee removal.